I really enjoy and value having guest speakers come into school and talk to the pupils. They can inspire and educate. They can also enlighten pupils who have a very narrow experience of life. But they can touch a nerve and be a little to close to home. We have a 6th social coming up, and drink is served along with the meal. It’s part of educating and preparing them for life outside of school. We have very clear guidelines that pupils are aware of and staff. For example they are allowed three drinks but the last one isn’t allowed until the last hour of the event. It’s not a race after all. 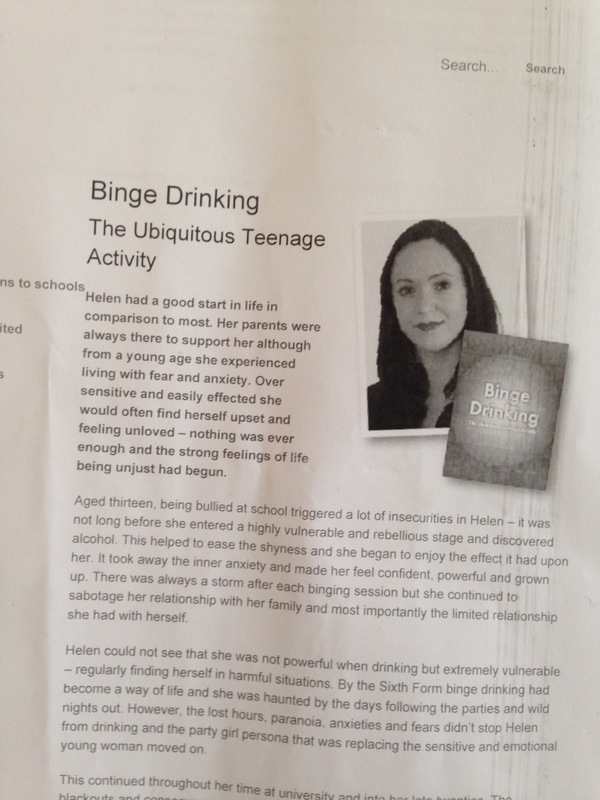 Part of this education is inviting in someone to talk about binge drinking. She was great, honest and relatable for our students. She spoke for an hour. I watched the students reaction. This was their first guest speaker, they will have one every week with topics that range from Careers, Consent, Contraception and Politics, but this was a tough topic to start the year off with. As Helen said, 1 in 10 will suffer from a drink related issue at some point in their life. So in a hall of 100 students, there had to be some that were living with issues like this already. They could be already following the same path as Helen ( she started drinking at 14) or their parents could be alcoholics. Some students I am aware of as a DSL and I normally give these students a heads up what the topic is about, giving them the option not to attend. Students who’s lives have been affected by Cancer normally opt out of the talk by Macmillan Cancer research for example. But there are always students who I am unaware of, and these are the ones who I worry about the most. So after Helen talk, I hung around outside and sure enough a student found me upset and angry. His life has been tough. Last year, while studying for his GCSE, he had to deal with the fact that his mother and father had split up, a restraining order was placed on his father due to Domestic Abuse with his mother, which he had been witness to for several years. The only place he could stay was at families which was round the corner from him father so he saw him every day. The father struggled with this and tried to take his life several times. He was then living with her mother in one room, all while revising for his exams. I knew all about this, but I knew nothing about the fact that his father drunk, a lot. In fact he had been through the AA programme 5 times. So Helen’s talk obviously hit a nerve and to expect that student to then ” just carry” on with lessons for the rest of the day is impossible ( and heartless). So I sat with him through break and my free period. He then went to the Health centre for some down time and then felt he could face the world again. After these types of guest speakers, schools need to make sure that they have a support mechanism in place, with time for teachers to give to the pupils. And time is the challenging aspect, especially when schools are stretched as it is. PSHE is being squeezed and more and more topics are expected to be covered in such a small amount of time. Getting a guest speaker can help with staff who aren’t experts in the topics but the teachers are the ones that know the students best and are there to support the students, on that day and then next and the next. I am a therapist and school counsellor to a number of independent schools. I completely agree wth your comments and it’s refreshing to hear these comments shared as so often children are left with their own feelings following a talk – not knowing where to go with these! Must give credit to speakers also as mostly my experience is the speakers give time to pupils to talk or ask questions after the talk.